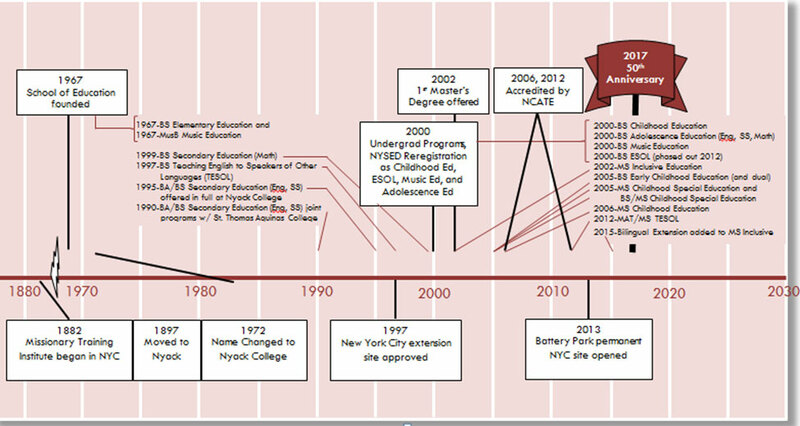 Welcome to Nyack College’s School of Education’s website. As you peruse the site, you will uncover the qualities that make our programs distinct…our students, our faculty, our commitment to excellence, to service, to leadership and, importantly, to the Core Values of the College. Fifty years ago, Ethel Huttar, Joyce Bailey, Elsie Barney and Lillian Hess with the assistance of Ralph Young, launched the education program at Nyack Rockland, which led to New York State certification. Over the decades, we have been blessed with God’s favor and an educational ministry that brings glory to His name. Take a look at how far we’ve come since 1967! Teacher candidates are instructed to be “the salt of the earth”. This summarizes the belief that candidates and professional faculty in the School of Education strive to become, by God’s grace, individuals who reflect the properties of salt. They are to season and enrich the lives of others. They are to become the preservative of hope and encouragement to others. Ultimately, they are to become healing agents serving others who need help overcoming the difficulties of life. As you review our blog posts, you will see our faculty and students embracing our Conceptual Framework to go forth and be “the salt of the earth”. Our undergraduate teacher preparation programs train candidates to teach in the following areas: Childhood Education (Grades 1 – 6) and Music Education (K-12). Successful completion of our undergraduate programs leads to New York State initial certification and certification from the Association of Christian Schools International. Details on programs and clinical experiences are available here. We also have Master’s level preparation which leads to Initial and/or Professional Certification in Childhood Education (Grades 1 – 6), Childhood Special Education (Grades 1 – 6), and in Bilingual Education. Finally, we are delighted that you are considering Nyack College and teaching as a possibility for your major course of study. 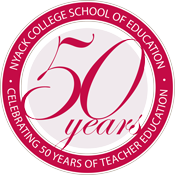 For more information about becoming a teacher education student, contact admissions@nyack.edu. The School of Education is committed to prepare candidates with practiced, research-based methodology that is character based, integrating the historical evangelical Christian tradition of the college, so they are ready to enter the inclusive classroom. To fulfill these values, the unit is committed to the preparation of professional educators who are capable of working effectively with diverse populations in a constantly changing global community. Our conceptual framework guides the curriculum, instruction, structure and assessment for the professional education programs in the School of Education. The framework, based on the SALT acronym representing Service, Academics, Leadership, and Teaching, is comprised of a standards-driven, student-centered, assessment-based, collaborative approach. Equip candidates with a competency in working with diverse student groups by the use of effective teaching methods. Instill within the candidates sensitivity to individual and cultural diversity as they work within a variety of contexts and communities and understand the benefits of partnering to improve education. Guide candidates to an understanding of the impact of teaching on the greater community and the world. Enable candidates to articulate and apply appropriate competency-based standards and principles addressing teaching, curriculum, assessment, equity, and technology, and to demonstrate the associated ethical dispositions. Empower candidates to articulate, demonstrate, and value the interconnectedness of academic standards, dispositions related to academics, and the broad philosophical connections, resulting in well-rounded academic preparedness for the teaching profession. Prepare candidates with research-based understandings and skills to create a bridge among educational theory, research, and practice in response to the educational, social and psychological needs of society. Develop candidates as transformative leaders as they envision and implement a nurturing, stimulating, inclusive, international environment for students, schools and communities. Prepare candidates to effectively communicate with diverse populations in a variety of media and modes, as they voice ethical dispositions regarding issues of justice, access, and equity while employing a filter of a Christian worldview. Engage candidates in professional growth activity so they may respond to educational needs of diverse learners, schools and communities with insight, vision and collaborative effort. Develop candidates who are able to design, implement, and evaluate the appropriateness of instruction and refine practices. Prepare candidates willing to work strategically together with professional partners, colleagues and community to facilitate the implementation of collaborative learning environments in professional education and K-12 settings. Equip candidates with an understanding of effective ways to utilize appropriate assessment-based approaches for the improvement of student learning and educational practice. We need to be careful what we convey to our children about the common core: it is here to stay and if we stay focused on the objective to make our children college ready, academically excellent, and self-regulated learners, we will increase their self-efficacy to accomplish the demanding tasks and challenges ahead. Nyack College is proud to hold accreditation from NCATE. The School of Education is hosting an Onsite Visit in October for accreditation by CAEP (NCATE’s replacement).